These are the badges of several of the Private Star Ships that operate out of the Web, that vast interlocking structure that forms part of the immense orbital port and trading centre of Merkat Three. Operated by sharp-witted and resourceful crews under owner-Captains, the ships ply their mercantile trade across zones Alpha through Mu of the mapped galaxy, frequently in areas that no ships of company-operated merchant fleets dare fly. The PSS fleet ships (known throughout the mapped zones as Pirates by those who don't value their own skins very much) look upon the Web of Merkat Three Port as their home-away-from-home, their relatively safe harbour and the place from where their crews can catch up with old friends - and others... 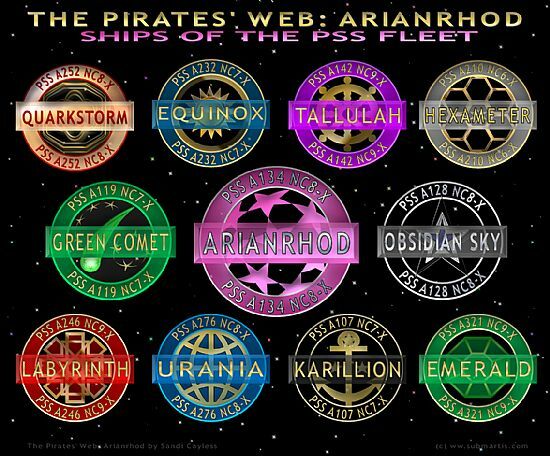 The PSS Arianrhod under Captain Cinnabar Ahxenta is the most well-known of the Privates and the adventures of that ship and her crew can be found in: The Pirates' Web: Arianrhod by Sandi Cayless. See the LINKS page for more information.